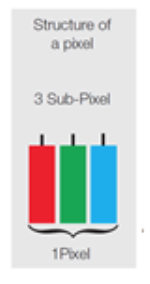 What are pixels and subpixels? What do the abbreviations TFT and CSV mean? All Toshiba LCD displays are either built with the state of the art Thin Film Transistor (TFT) or with the ultra bright Clear Super View (CSV) technology ensuring a brilliant and razor sharp image. Does Toshiba abide by any specific regulation regarding pixel faults? Yes, Toshiba’s quality control for LCD screens is based on the strict ISO 9241-307 (Fault Class II) standard. What types of pixel faults might I encounter? What is the maximum acceptable number of pixel faults? How can I find out which screen model I have? Simply view the technical information of your product to detect the kind of screen you own. Please be aware that one screen model can have different resolutions, for example the HD+ screen can have a 1600x900 or 1680x945 resolution. The display resolution is the number of distinct pixels that can be displayed in the screen’s dimensions width and height. In the table (Q5) you find the different resolutions in brackets. For example a screen with a 1024x600 resolution means there are 1024 rows and 600 columns of pixels. Thus the screen consists of a total of 614400 pixels which are almost 2 million sub-pixels. What am I to do if I find more pixel faults on my screen than are acceptable? If you discover more pixel faults, regardless of their type, you are entitled to make a warranty claim. In such cases, please contact the Toshiba Support Centre or your preferred Authorised Toshiba Service Provider in order to make a warranty claim.